Dr. Kapil Kumar Chattree, MBBS, MD, DM(Cardiology) is a Senior Consultant- Intrevention Cardiology at Mukat Hospital, Chandigarh. Dr. Kapil completed his basic medical studies (MBBS) followed by his post graduation in Internal Medicine from the famous medical institute, Christian Medical College, Ludhiana. Subsequently, he pursued his super specialization(DM) in Cardiology from the same institute. Thereafter, he attained prestigious B.Braun Fellowship in Post Graduate Studies - Cardiology. 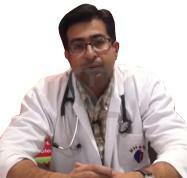 Dr. Kapil is well known for his distinctive work in the field of Intervention Cardiology. Before joing Mukat Hospital, Dr. Kapil had long association with the renowned hospitals like CMC Ludhiana & Fortis Hospital, Mohali where in he successfully conducted 5000+ procedures of Intervention Cardiology. Device Implantation like Pacemakers( Single/Dual Chamber), Biventricular Pacemakers, Implantable Cardioverter Defibrillator (ICDS) etc. To his credits, Dr. Kapil had brilliant credentials throughout his academic career and won various distinctions & awards. He has also contributed many research papers to various national & international journals & has presented them in many conferences of his clinical domain. Bali HK, Chattree KK, Bali SK, Chauhan HKC, Shukla CP. A tale of early Reel syndrome caused by an over-enthusiastic masseuse. Indian Heart Journal. 65 (6), pp. 703-704. Bali HK, Chattree KK, Bali SK, Chauhan HKC, Shukla CP. Collateral approach for LV lead implantation in a case with abnormal venous anatomy. Indian Heart Journal. 65 (5), pp. 607-610. Bali HK, Chattree KK, Bali SK, Chauhan HKC, Shukla CP. PCI in a case of dual (Type IV) LAD with anomalous origin of the LCx from RCA. J Saudi Heart Assoc. 26 (1), pp. 43-46. Bali HK, Chattree KK, Chauhan HKC. (Apr 2014). An Indian Overview of the “TR.A –PCI in STEMI” Conundrum: Is Radial STEMI Ready For Prime Time J Am Coll Cardiol. Suppl. Issue. Apr 2014. Bali HK, Chattree KK, Chauhan HKC, Shukla CP, Narang SV. The “TRA – PPCI in STEMI” Conundrum: High time to advocate radial primary angioplasty as the gold standard treatment for STEMI patients. Indian Heart Journal Volume 65, Supplement 1, December 2013, Pages S50-S51. Bali HK, Chattree KK, Chauhan HKC, Shukla CP, Narang SV. Percutaneous coronary intervention in octogenarians: An insight into the clinical presentation, angiographic profile & procedural outcome (in – hospital MACE and intermediate term clinical follow – up). Indian Heart Journal Volume 65, Supplement 1, December 2013, Pages S59-S60. Bali HK, Chattree KK, Chauhan HKC. (Sept 2014). Aortic dissection after Bentall’s repair. TCT (Transcatheter Cardiovascular Therapeutics). Washington, DC. Bali HK, Chattree KK, Chauhan HKC. (Sept 2014). Coeliac artery ostial CTO angioplasty through retrograde technique: so near yet so far! TCT (Transcatheter Cardiovascular Therapeutics). Washington, DC. Bali HK, Chattree KK, Chauhan HKC. (Sept 2014). PCI in impending cardiogenic shock tackling multiple culprit lesions TCT (Transcatheter Cardiovascular Therapeutics). Washington, DC. Bali HK, Chattree KK, Chauhan HKC. (Feb 2014). Percutaneous device closure of left ventricular free wall rupture site - A new therapeutic option for the ruptured pseudoaneurym. Prof. M. Fagih Award presentation. 25th Annual Scientific Conference of the Saudi Heart Association. Riyadh – Saudi Arabia. Bali HK, Chattree KK, Chauhan HKC. (Feb 2014). Renal Artery Stenting In A Patient With Dissected Only Functioning Renal Artery. 25th Annual Scientific Conference of the Saudi Heart Association. Riyadh – Saudi Arabia. Bali HK, Chattree KK, Chauhan HKC, Shukla CP. (Oct 2013). Endovascular repair of giant ruptured aneurysm of coeliac/ hepatic artery. TCT (Transcatheter Cardiovascular Therapeutics). San Francisco – California.